It was with eager anticipation that we boarded an Alaska Air 737 in Seattle, bound for New Orleans the second week of December. SteveT, his wife Henny, and I would be meeting up with SteveL, a grad school friend of mine, in New Orleans and we all had dates booked with bull Redfish somewhere in the marshes of the Mississippi somewhere south of New Orleans. We had planned and booked this almost a year in advance, as prime weekend dates--November through January--tend to book up very quickly with the best guides. I like to think of the winter fishery in Louisiana as the best and most consistent sight fishing fishery anywhere in the continental United States. The fish are always there (seeing them, with sunlight, is of course another matter altogether) in shallow water (over 2 feet is considered “deep”), they don’t spook easily (you pretty much try to land the fly on their head) and they are big (20 to 30 pounders are a reasonable expectation in the winter). 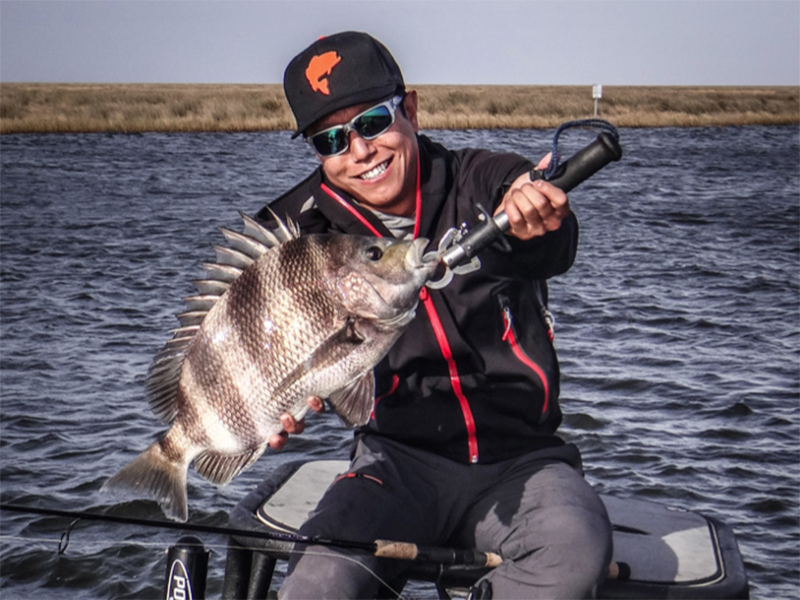 Throw in the odd Black Drum, a few shots at the fun but finicky Sheepshead, various bird life, dolphins, Nutria, and being in the marsh in winter chasing bull Redfish is always a treasured experience. The forecast for our trip looked OK. The first day was sunny with 10 to 15mph winds, the second day was cloudy with 15-20mph winds and the third day was cloudy with 25-plus mph winds (and maybe not fishable). As with any sight fishing destination good sunlight is always the most critical factor. The waters aren’t aquarium-clear, so looking for the off color patches of a monster Redfish gets impossible quickly when the clouds spin up. SteveT told me that he “needed” to catch a redfish over 20 pounds. I told him he had a good chance, though I could tell he was going to hold me responsible if he came up short. In terms of gear I brought 6wt and 7wt Scott S4S rods, Hatch 5+ and 7+ reels with Rio Outbound Short floating lines, and one medium power spinning rod with a Shimano Stella 2500FE. Friends brought a host of 8wt rods and SteveL brought his beautiful Sage Smallmouth rod, excellent for the short accurate casts that are the hallmark of sightfishing for bull redfish. Flies were fairly simple, any sort of crab or baitfish imitation with decent weight (I used Size Large Hareline pseudo eyes). On the terminal end we used 20lb fluoro tippet on relatively short 8 foot leaders. We stayed at Woodland Plantation, a beautifully restored bed and breakfast type place that caters almost exclusively to sport fishermen, about an hour’s drive south of the New Orleans airport. Cozy accommodations and truly delicious food, along with many guides who will pick you up at Woodland make it a great option for these trips. The first day looked like the best day of the trip in terms of weather so we headed out knowing that this was going to be our best shot at fish. In general the first couple hours of the day aren’t the best – the winter sun angle is pretty low, even that far south, and with the oblique sun angle it’s sometimes difficult to see fish in the early morning, even in 18 inches of water. So we poled and poled, scanning the waters with eager anticipation for that familiar golden bronze hue marking the big reds. Finally by 10:30am or so we started to see some fish and get some shots. 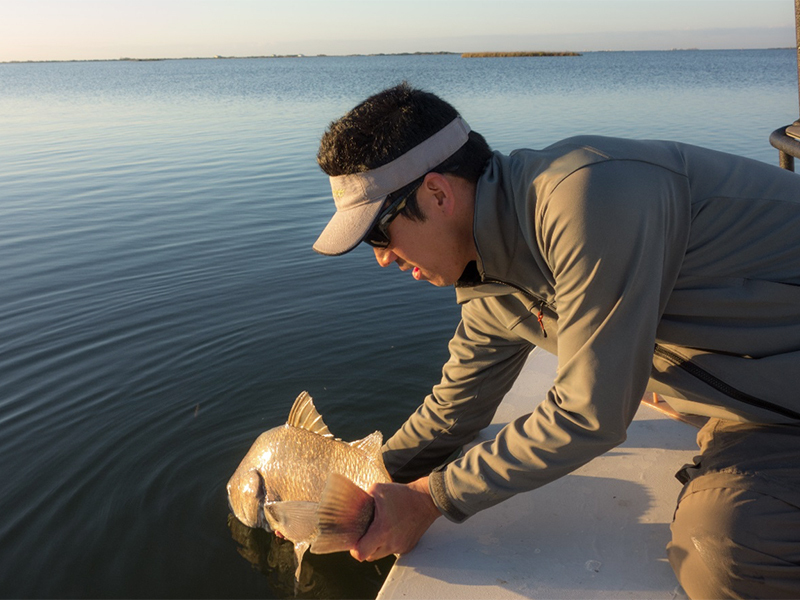 Redfish are kind to fly anglers in that if you drop the fly on their nose, they will usually eat. The hardest part is, of course, dropping the fly on their nose. Fish would appear at awkward angles and distances. “Look back at five o’clock, six feet” or “dead ahead, three feet” were common refrains--casting quickly and accurately with a nine foot rod to a fish three feet away and moving towards the boat is not easy. So yeah, we missed shots, we bungled shots, we saw big Redfish swimming off after much flailing, taking with them a bit of our fly fishing egos. But we caught fish, too, and by lunchtime had landed a few quality Redfish, with SteveL bringing in a fat fish of 15-18 pounds just prior to sitting down for a few minutes to wolf down some sandwiches and an Abita Amber or two. Sitting out there in the marsh, surrounded by wildlife and the ever present mark of the energy industry (oil rigs, pipeline warnings, etc. ), you wonder how the two have managed to co-exist for so long (easy answer, not very well actually, just ask BP) and how much longer they will be able to do so. You wonder about the folly of mankind trying to control nature, trying to dam the Mississippi and choking off silt and freshwater relied upon for renewal by the marsh; you wonder at the folly of mankind seeing the entire natural world as a “resource” placed their for its extractive benefit, Redfish almost entirely wiped out because one random dude came up with a really good recipe that made them delicious table fare. You wonder at all this, you drink a beer, and then you pick up a fly rod and appreciate, all the more, each and every cast that you get to make to these amazing creatures in this fragile environment. In the afternoon of that first day the fishing got better, after a brief post-lunch lull. We entered a pond-like area of the marsh and it seemed that there were redfish everywhere. As I was on the casting platform, 20 to 25 pound reds were popping up right and left, many already spooked because they were too close to the boat. Finally I saw one coming at the boat from 2 o’clock, about ten feet away, and managed to flip my Scott 6wt S4S over just in time to drop my fly in front of the fish. And finally there it was--what I had waited for for a year--that clear shot of a bull redfish, mouth open, coming to inhale your fly. These are the memories that sustain us, or drive us to madness. 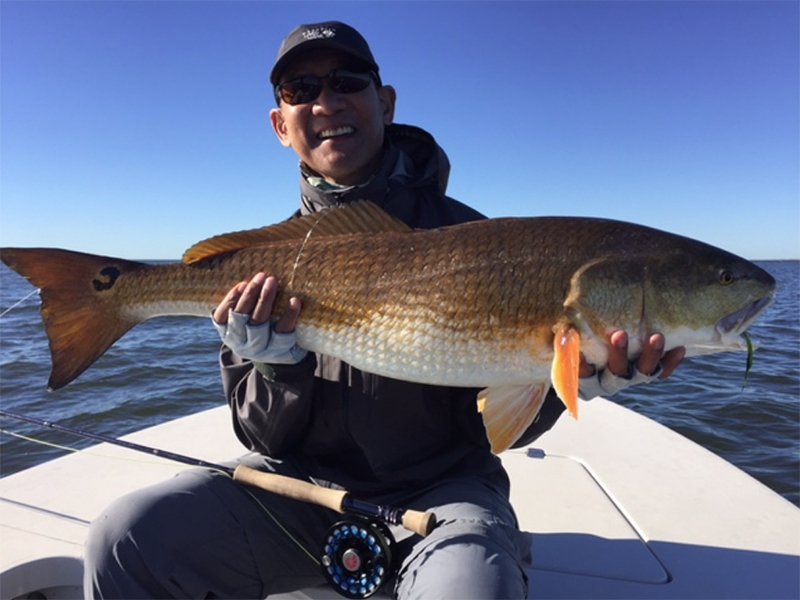 A brief fight later, and I landed a 25lb Redfish--my second largest on the fly rod. Fat, beautiful, glowing in the afternoon sun. 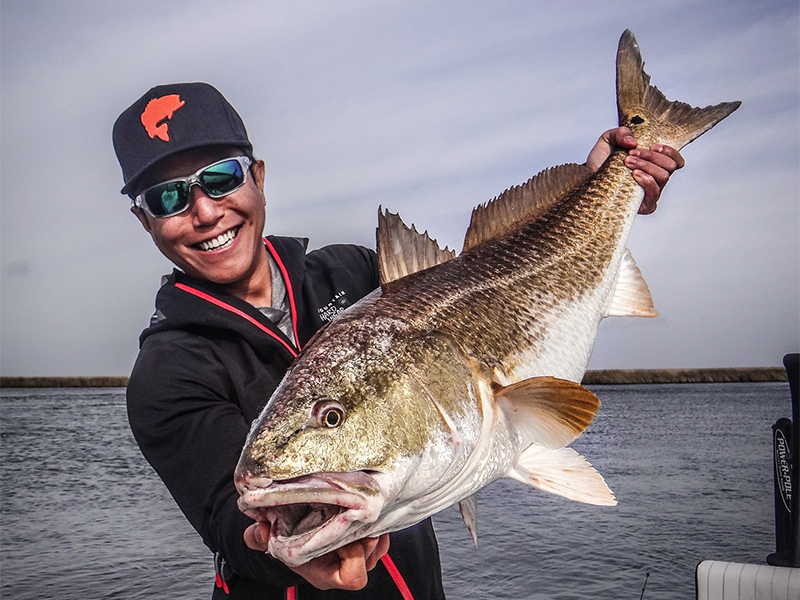 We picked up a few more reds that afternoon before finishing up the day casting to tailing Black Drum on the incoming tide – SteveL hooked up to a nice fish that might have pushed 20 pounds after he laid out a nice 40 foot cast to a tailer tucked right up to the marsh grass. On the other boat, SteveT reported that he and his wife caught a handful of fish, with one perhaps pushing ten pounds. Day Two dawned as the forecast predicted, slightly cloudier than Day One with slightly more wind. We had packed the spinning rod tipped with a Heddon walk-the-dog type topwater plug for this reason. We saw some fish, but the cloud cover limited our sight radius to perhaps four or six feet right around the bow, and we had a difficult time getting a good cast off in time before the fish had seen the boat. Thankfully SteveL averted the skunk as he caught a nice 18lb Redfish blind casting the topwater plug – I didn’t see the take but it sounded like someone dropped a bowling ball in the water, which I guess it what happens when an 18lb fish explodes the surface in a foot and a half of water. SteveT, on the other boat, did better than we did on the fly rod, catching a few, though nothing over 10 pounds. The worst news of the day was that the forecast for our third and supposedly final day had not improved, and was still calling for winds to 30mph, and heavy cloud cover, with rain late in the day. We made two decisions – the first was to fish a fourth day, Monday, since the weather looked great, and head straight to the airport after a slightly early end. The second was that while SteveT and his wife would sit out Sunday, SteveL and I would head out with spinning gear and some dead shrimp to see what we could make happen. So on Day Three we left the dock with a bag of dead shrimp, some bait hooks, some one-ounce sinkers and a fistful of spinning rods. Our guide said that he hadn’t really done this kind of fishing in the marshes before, but that we’d give it a try and see what happened. So we pulled up to a bend in the marsh that had a good convergence of current in a deep hole (20+ feet), baited some hooks, and tossed them in. I waited as my first cast tumbled along in the current, sinker bouncing off the bottom as I felt a solid tap and set the hook into a big fish. 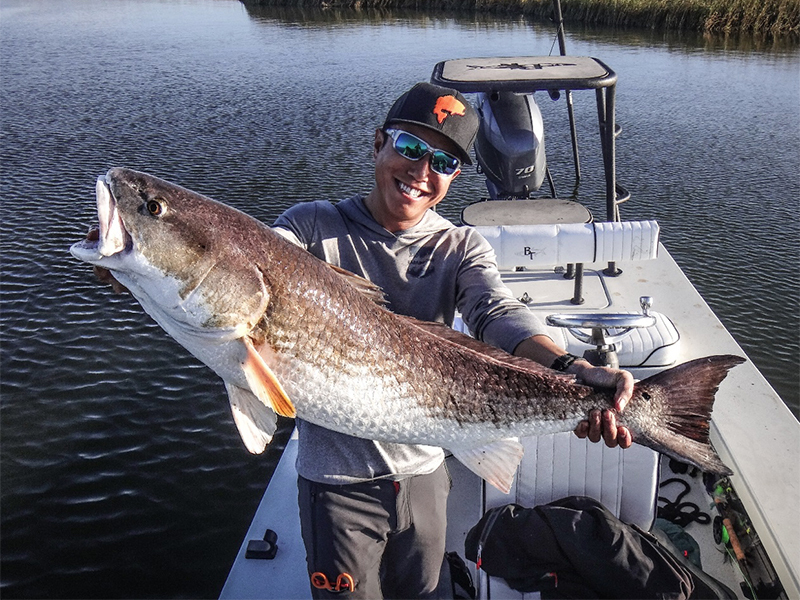 I felt a series of hard head shakes and a few good runs – I didn’t really know what it was until we saw color and it turned out to be a 19lb Redfish! Apparently they fight differently in deep water and apparently, dead shrimp works quite well! We sat at that spot for a while and caught several speckled trout and a couple of rays before SteveL hooked into a monster. Caught in the current, it pulled and pulled – it surfaced once about 50 feet out and it looked like a small porpoise. 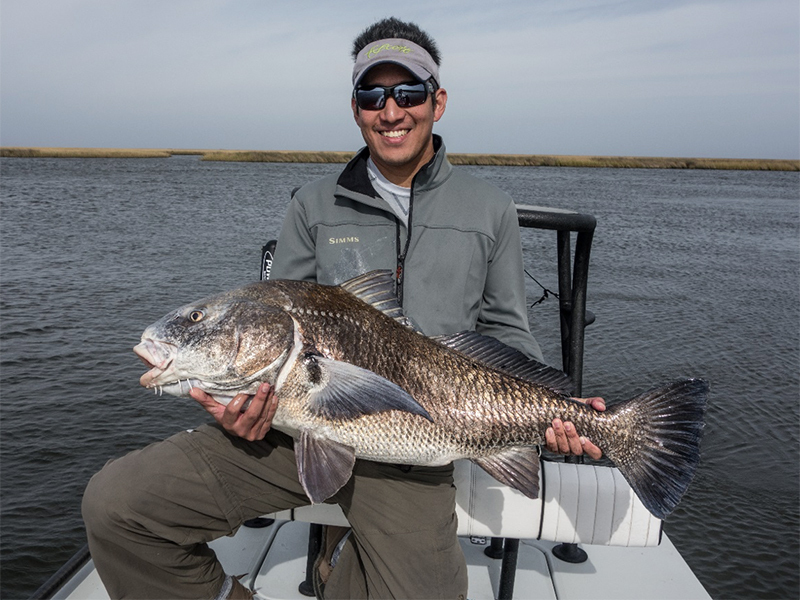 Finally, after a good 20 minutes, he pulled in an absolutely Brobdingnagian Black Drum that went an even 40 pounds on the Boga grip. Apparently, they too, like dead shrimp. Trying another spot over similar deeper water, we later lit into a bonanza of big (6-9 pound) Sheepshead, some 10-15lb Redfish, and more black drum. For good measure, I even caught a small Croaker, a species first for that area! All in all, we probably put over 100 pounds of fish in the boat that day--lesson being, always bring spinning gear and be ready to roll with shrimp if the weather gods bring you clouds and wind. And finally the story of the trip, at least from SteveT’s view, was thank goodness for Day Four. It dawned brilliant, blue, and beautiful (of course almost any day where you wake up and all you have to do is go fishing with your friends could be described this way). No clouds in the sky and water so still you could read the proverbial newspaper reflection in them. I should note that by this time, SteveT had reduced his “must catch” Redfish from 20 pounds to 15, though I was still feeling significant personal pressure (he came all the way from Hawaii on my recommendation just for this!) The catch today, however, was that we were going to miss the best tides since we had to be in a bit early; the first few hours we plied waters where our guide said, “They were all here, stacked up, yesterday!” But of course they were. As the tides slowly turned, however, we started to see fish. Big fish. Some over 30 pounds, easy. Somewhat surprisingly, though, despite some well placed casts and follows, these fish weren’t eating. Many would follow right to the boat, then turn tail. We noticed an alarming amount of injured and dead bait (small two to three inch baitfish up to larger Pogies) in the water and speculated that the Redfish could eat their fill with little effort and maybe would have a reduced incentive to chase down and inhale a fly. We caught a few fish--SteveL stuck a ten pounder or so on a foot of water and I caught a 16 or 18 pound fish at a small creek mouth. SteveL also foul hooked an enormous Alligator Gar almost six feet long and put up some good runs before pulling free. SteveL and I got back to the dock at 2pm, as scheduled--we packed away our rods and changed and waited for SteveT and his wife to show. And waited. And waited. And started to worry, as 2:3pm0 turned to 2:45pm--just as our guide had put his boat back in the water to go look for them, they rounded the corner and came into view. 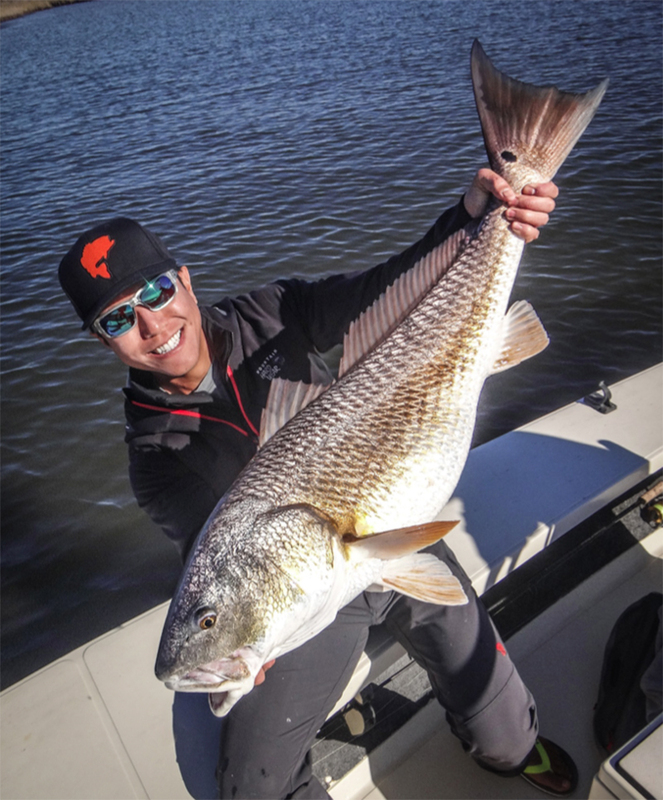 Sure enough, on the last cast of the trip, SteveT had sighted and hooked a 20+ pound redfish! So, with a perfectly acceptable excuse for being late, we piled into the car and raced off for the airport, four satisfied anglers. In summary, we had a great time--great accommodations, great food, and great fishing. On days with good weather we caught big fish. On days with bad weather, we struggled--until we brought out the shrimp. And I still say, the best and most consistent sight fishing in the contiguous 48 states--southern Louisiana and bull redfish in the winter. Till next time!